Microsoft’s Windows 8 is now a more popular operating system than the reviled Windows Vista, eliminating a source of embarrassment as Microsoft’s latest OS slowly continues to gather steam. According to Net Applications’ NetMarketshare tracker, Windows 8 captured 5.10 percent of all desktop systems the firm tracks for the month of June. Vista’s market share now stands at 4.62 percent. Of course, both will need a few months (or years) before they pass Windows XP and Windows 7, both of which dipped about half a percentage point’s worth of share to finish the month with 44.37 percent and 37.17 percent, respectively. Both Windows 7 and Windows XP’s sales are on the wane, Net Applications says, but it will be several years before Windows 8 passes them by. Windows 8 passed Mac OS X 10.8 in February. If Windows 8 continues to increase its share at its current pace of about 0.5 percentage points per month—and if Windows XP continues to decline at about the same rate—Microsoft would need roughly 32 months, or until about February 2016, for Windows 8 to pass Windows XP. 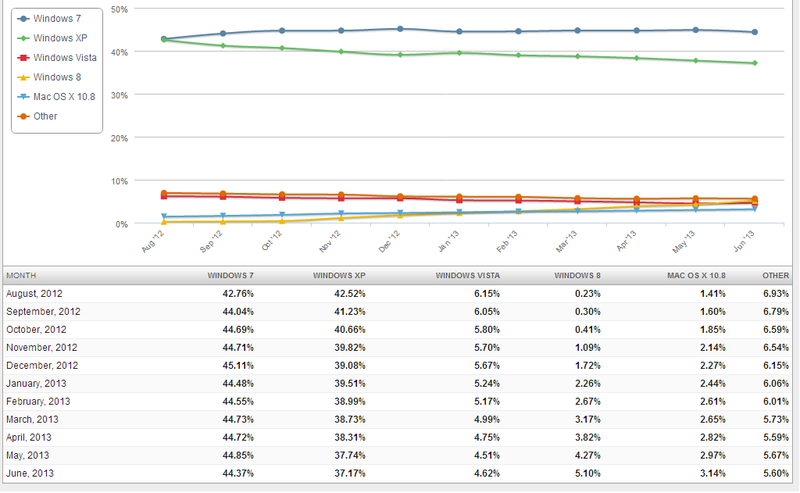 Overall, Net Applications puts IE in a commanding lead, with 56.15 percent of the market, versus 55.98 percent in May—thanks to Microsoft bundling IE with PCs, of course. Net Applications puts Firefox at 19.15 percent, down from 20.63 percent, and Chrome at 17.17 percent, down from 15.74 percent. 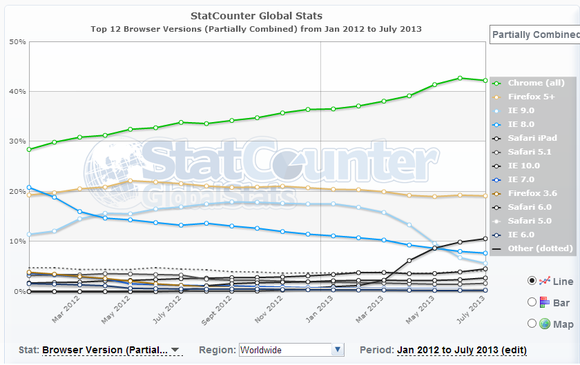 If you combine the various versions of Chrome, as StatCounter does, Google’s browser is the most popular. 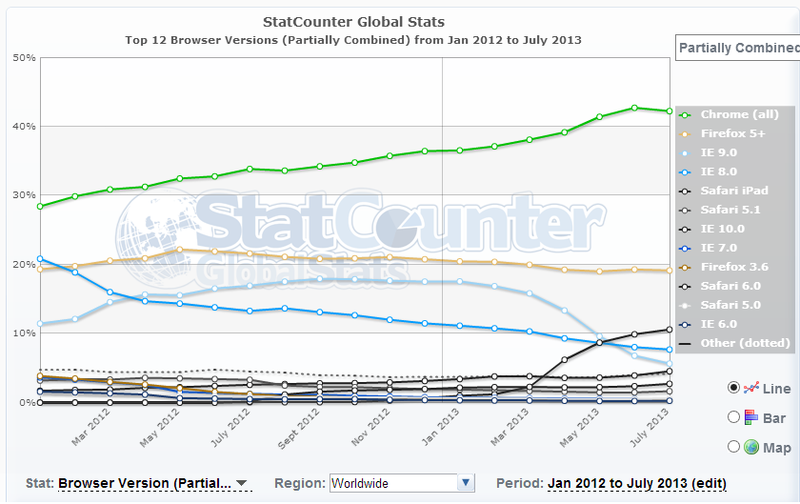 Microsoft exited Build 2013 with momentum that it hasn’t had in some time. The latest information suggests that consumers agree.